Kanelo jumped off the page at us. We had been discussing the possibility of rescuing a dog and were looking through the Petfinder site in January of 2014 to see who was out there. We knew almost immediately when we saw him that he was our boy. He was a senior at just under 10 years old, his birthday coming up in about six months. We were told that he had been given up by a family who didn’t have time for him to the point that he had been ignored; the rescue told us that when they went to pick him up, he didn’t even lift his head off the floor; Kanelo was broken — not physically, but emotionally. Within a matter of days of bringing him home, we could already see a change in him. He was engaged. He was happy. He spoke to us with his eyes and soon came to relish the idea that we were his new people and he mattered. We talked to him, and he listened. He followed us around the house, always wanting to be with his people. We took him places: down to the lake, in the truck even if we were just going to get a drive-thru coffee; he was part of the family and he knew it. He was more than a little bit of a bed hog, accommodated by his own set of stairs to climb up and lay claim to the middle half of the bed. And he snored, sleeping the comfortable sleep of one who knows he’s safe. Over the next two and a half years, we celebrated Christmases and birthdays (including his, of course, complete with specially crafted treats from a doggy bakery) and the annual opening of the pool. He won the “First in the Pool” trophy three springs running, not remotely seeming to care that the water temperature was in the low 50s — he just wanted to get in there. In the late spring of 2016 leading up to his 12th birthday, he would occasionally get a little wobbly on his feet, but he was an old guy, so we didn’t really give it too much thought until Thursday, June 2 — two days before his birthday — when he stopped eating. We took him in to the vet the next day where they ran some bloodwork, and it was ultimately determined on Tuesday that he had spleen cancer, which is very aggressive and had spread rapidly. By that point he needed help to get his back end up off the floor, and as a dog who had never been much of a “cuddler,” allowed himself to be carried to the couch when he couldn’t quite make the trip from the back yard to the front room on his own. On diagnosis, the vet had indicated that Kanelo was having a pretty difficult time and only had a few days left. It was by far the singularly most difficult decision we had to make, but the most selfish one for us not to make. We decided to take him home for one last night. Kanelo slept on the couch and we slept on the floor, spending the entire night by his side. In the morning, as a special breakfast treat, he gulped down a whole sausage breakfast sandwich in one bite; there was no way he was going to be dainty with that thing. We laughed and we told him what a good boy he was and as he wagged his tail, I swear he was smiling. 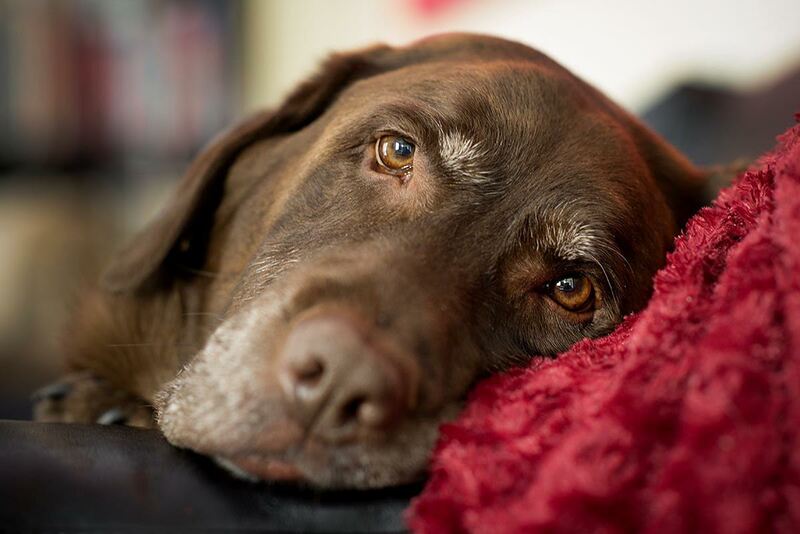 A little before noon on June 8, the vet arrived at the house with an assistant and, with many tears and hugs and kisses, we said goodbye to our big brown bear. He was gone so quickly and it took time to get our heads around the fact that he just wouldn’t be greeting us at the door any more.